'Arsenic and Old Lace' runs through Feb. 10 at Andrews Hall, 276 E. Napa St., Sonoma. Thursday–Saturday, 7:30pm; Sunday, 2pm. $25–$40. 866.710.8942. sonomaartslive.org. 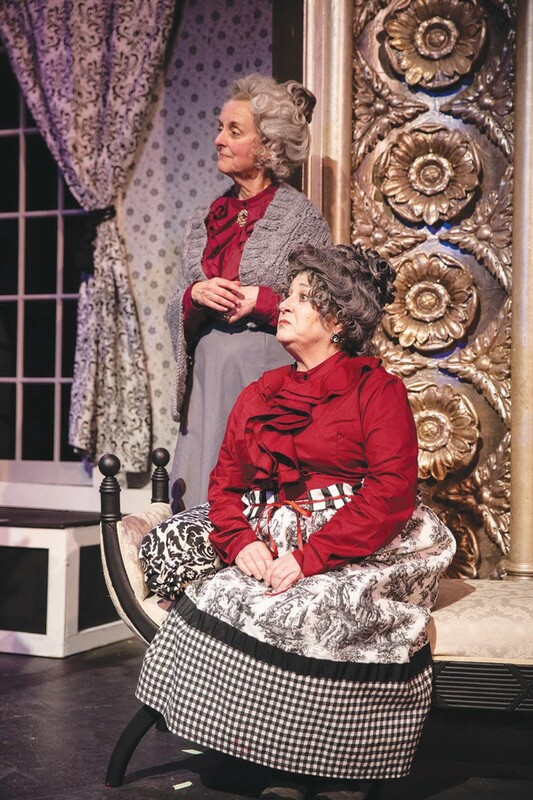 Serial killing would seem to be a rather ghoulish subject matter for a comedic play, yet Arsenic and Old Lace has been an audience-pleaser for over 75 years. Sonoma Arts Live has a production running through Feb. 10. Joseph Kesselring's tale of the Brewster sisters and their pension for helping men meet their maker via elderberry wine debuted on Broadway in 1941, with Boris Karloff as black sheep Jonathan Brewster, and ran for 1,444 performances. A film adaptation followed in 1944, and though the play has since become a staple of American theater, it's starting to creak. Mortimer Brewster (Michael Coury Murdock) returns to his childhood home and to his aunts, Abby and Martha (Karen Brocker and Karen Pinomaki). After getting engaged to the local preacher's daughter, Elaine (Julianne Bradbury), Mortimer is horrified to discover his aunts have taken on a most macabre hobby. They're helping lonely old men find "peace" and disposing of their bodies in the basement. Fortunately for them, Uncle "Teddy" (Tim Setzer) believes himself to be Teddy Roosevelt and is always willing to dig a new lock for the Panama Canal and the latest "yellow fever victim." Director Michael Ross has some good talent at work here. Brocker and Pinomaki are delightfully dotty as the sisters, and Setzer invigorates the stage with his every appearance. Michael Murdock, however, is too one-note as Mortimer, showing little range of emotion considering the insanity that's going on around him. He rarely seems to be "in the moment," often appearing to be casually awaiting his next line. Julianne Bradbury is far more animated as Elaine, making one wonder what she sees in Mortimer. Schaeffer and Roberts are two very talented actors, but I'm not sure these were the right roles for them. I found Schaeffer's menacing Jonathan undone by his distracting John O'Hurley–like voice (O'Hurley played J. Peterman on Seinfeld), and Roberts' baby-faced Dr. Einstein seems too youthful to capture the character's exhaustion and desperation. Nice stagecraft does complement the performances. The black and white set by Michael Walraven and costumes by Janice Snyder evoke a classic-cinema, period-film feel.